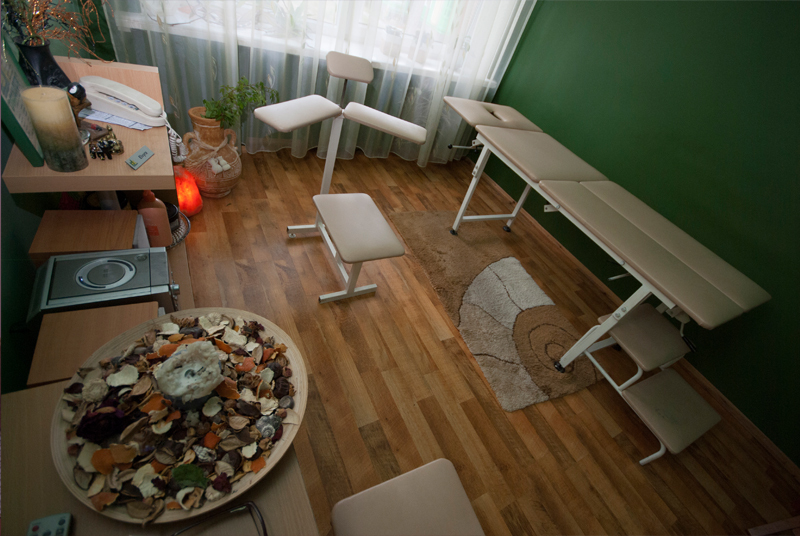 „Dainava“ establishments has a wide range of therapeutic massages, healing baths, physical therapy and other medical and health procedures. Massage helps to maintain a good body and soul condition. It is often combined with other treatments – physical therapy, physiotherapy, water procedures. Relaxing full body massage – 60 min., 27€ The procedure is done by hand masseur or special equipment. The procedure is performed in such a way that in a specific order entire body is massaged. 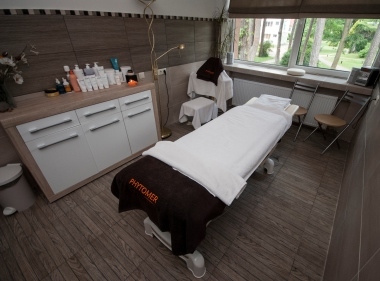 Back and shoulder massage – 30 min., 12€ The procedure will help you get rid of back pain and headache, relieve tight muscle groups and strengthen them, procerure will to preserve the natural shape of the spine. Back massage with bishofit (minerals) – 30 min., 14€ During the procedure, the skin, connective tissues and muscles enriched with magnesium, minerals and trace elements. Effectively suppressed the pain and inflammation, improves microcirculation, reduces muscle fatigue, tension, rigidity and spasms after injury, sports and physical exercise. Foot massage – 30 min., 11€ It improves the flow of energy in your body, strengthens the nervous system, reduces tension, stimulates internal organs, blood circulation, eliminate insomnia and headaches, regulates blood sugar levels. Foot massage with bishofit (minerals) – 30 min., 12€ Massage is recommended for patients with arthrosis, arthritis, polyarthritis, epikondilitu at the joints of the foot strain, pain, fatigue, swelling. Magnesium minerals nourish the articular cartilage, bones, along with the Crimean juniper, eucalyptus from Australia and Siberian fir essential oils to improve mobility, pain, fatigue, and swelling of the joints. Head, shoulders massage – 30 min., 12€ Head massage positively affects the nerves of the head, strengthens the hair roots and destroys mental fatigue, helps to increase mental clarity and concentration. Hand massage – 30 min., 12€ Hand massage is massaged from the shoulder to the fingertips, stretching each finger and the finger joint. After the massage you will feel the lightness of hand, and your skin will feel smooth and soft. Healing classic full-body massage – 60 min., 27€ Procedure is designed to restore damaged body functions. After the procedure subsides backaches, headaches, improves blood circulation, tissue metabolic process, internal bodies process. Anti-cellulite massage – 30 min., 17€ The procedure improves blood circulation in adipose tissue. It stimulates blood circulation, the skin becomes smooth, firm and elastic. Massage helps to get rid of the uneven fat distribution. Underwater massage – 20 min., 8€ Improved metabolism. The procedure helps to reduce weight and tightens the skin. Recommended in patients with bone and joint, spine and neurological diseases. Massage with soy candles: hand massage – 30 min., 18€, foot massage – 30 min., 18€, back massage – 30 min., 20€, full body massage – 60 min., 40€. Massage is done with natural and organic high quality soy wax candles. This procedure works better than any cream or lotino. It will make skin soft, moistens, removes irritations. Peace and harmony massage candle (soy bean wax, pine and lavender essential oils and shea butter), the lack of peace and harmony you want. Good luck and joy candle (soy bean wax, mahogany, turmeric, sage essential oils and mango butter) when sunlight is needed. Anti-stress massage candle (soy bean wax, lavender, turmeric, eucalyptus essential oils and shea butter), Against fatigue and concerns. Vital forces massage candle (soy bean wax, mahogany, lime essential oils and cocoa butter) Against exhaustion, to feel the fullness of life. Love massage candle (soy wax beans, mandarin, ginger, turmeric essential oils and shea butter) when you want fascinate and shine. For procedure continuity massage candle – gift. 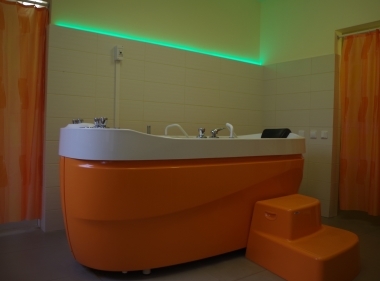 Therapeutic baths has positive affect for blood circulation, improves oxygen uptake, activates the metabolism. Procedures for reducing irritability, strengthens the immune system. Herbal pearl bath – 7€ During the procedure, the skin receptors are irritated improving: tissue blood flow, venous and lymphatic drainage, skin regeneration metabolism activation. The procedure reduces asthenia, headache, insomnia, improves whole body biotonus, has a calming effect. Herbal pearl bath with bishofit (minerals) – 6,50€ Bishofit is a natural mineral, which contains as much as 65 periodic table of elements, mainly magnesium as well as calcium, potassium, sodium, bromine, boron, iodine, copper, iron, silicon, titanium, lithium, etc. Minerals used for procedure effective in the treatment of musculoskeletal disorders, peripheral and central nervous system diseases, cardiovascular diseases, as well as treating sprains injuries, skin diseases. Bishofit inhibits inflammation, relaxes muscles, relieves stress and fatigue, strengthens the immune system, improves metabolism, skin and nails great condition. During the procedure, the body covered with minerals layer that remains for several hours. Pearl mineral bath with pine extrac – 6,50€ During the procedure, the metabolism is stimulated, skin is toned and revived, reduced stress and nervous tension, improves immunity, normalized blood pressure. Mineral bath – 5€ Procedure is effective in the treatment of nervous, cardiovascular, immune system, joints, spine, certain skin diseases. Intensify the visceral circulation, improves oxygen uptake, activates the metabolism. The procedure reduces irritability, strengthens the immune system of the body, prevents the development of atherosclerosis. Mineral bath „Sūrutis“ – 6€ During the procedure, stimulates metabolism, intensification of enzymatic reactions, improves blood flow to the tissue, improves the digestive system, strengthen the body's immune system and gets an anti-inflammatory and anesthetic effect. Pearl bath – 5,50€ It relaxes the muscles, positive effect on your central nervous system, reduce stress and insomnia, eliminate fatigue. During the procedure improves: blood circulation, metabolism, body oxygen uptake. Carbonic bath – 5,50€ During the procedure, improves your blood flow and tissue oxygenation, strengthens the heart muscle contraction. Treats for cardiovascular and respiratory diseases, central nervous system disorders, metabolic disorders. Herbal bath – 6,50€ Effective treatment for functional disorders of the nervous system. Relieves nervous exhaustion, headaches, insomnia, improves the body's biotonus. „The beauty of Ruby“ – 55 min., 20€ Rejuvenation, deep wrinkle reducing procedure is designed for mature skin. During the procedure skin of the face moisturized, nourished, the face is cleaned, massaged, algae mask used. „A Touch of the mist“ – 55 min., 20€ For sensitive, irritated skin. During the treatment, skin toned up, face massaged. Facial skin is cooled and relieved using seaweed mask. „Rain freshness“ – 50 min., 18€ Facial massage for oily, problematic skin. During the procedure, the face cleaned, skin toned. Facial cleansing mask with sea mud detoxifies the skin. „The Ocean“ – 40 min, 15€ Moisturizing procedure is designed for dry, dehydrated, dull, sensitive face skin. During the procedure, the face cleaned, toned with natural papaya enzymes. Moisturizing seaweed Laminaria mask added. The skin is bright, soft and smooth. „Source of fountain“ – 90 min., 45€ Body wrap with seaweed and clay. Not suitable for people with allergies to iodine. Seawater OLIGOMER®, brown seaweed Fucus and Laminaria digitata, white and gray clay – eliminates toxins and free radicals from the body. Hydrates, nourishes and replenishes minerals and trace elements body skin. „Red Coral“ – 60 min., 38€ This procedure helps effectively eliminate cellulite and toxins, reduce fat accumulation, toned skin. Procedure consist of body peeling, wrapping in seaweed mask and massage. „Morning Tenderness” – 60 min., 25€ The procedure, which involves a body peeling with sea salt and algae oils, creams and serums massage. Improves skin tone, stimulates blood flow, cleans pores, accelerating skin renewal, increases elasticity. Request of a body peeling, without creams and serums (cost of the 12€), duration 30 minutes. „Sea treasures“ – 20 min., 10€ Procedure with hot seaweed reducing pain and inflammation. Not suitable for people with allergies to iodine. Seaweed shake and OLIGOMER® (sea water) is heated, soothing sore place, removing toxins, tissue. Desingned for the back, feet and joints. (New) „Zanzibar“ – 60 min., 25,00€ Peeling and body massage. Gentle peeling of mandarins, oranges, vanilla aroma, cold pressed coconut oil, coconut powder from the island of Indian Ocean Zanzibar, refreshes and nourishes the skin intensively. Treatment reduces stress and tiredness. For men and women. Physiotherapy – is natural and artificial factors use for treating physical illness, injuries and rehabilitation. Impulse therapy – 2€ Procedure inhibits inflammation, relieves pain, improves tissue nutrition, promotes tissue regeneration, reduces spasms, stimulates tissue works. Designed to treat diseases of the nervous system. Magnetotherapy – 2€ The magnetic field inhibits chronic pain, stimulate blood circulation, vasodilatation a positive effect on heart function, treat ligament sprains, broken bones, burns and cuts. Magnetotherapy promotes rapid healing of wounds, after which scars are less visible. Magnetotherapy with device VIOFOR-JPS – 3€ Procedure has anesthetizing, regenerating – restoring effects (from trauma, inflammation, etc. )., Improves microcirculation (reduces, swelling, bruising and improves limb venous blood circulation) is used for diabetes treatment cases, adjust blood pressure. 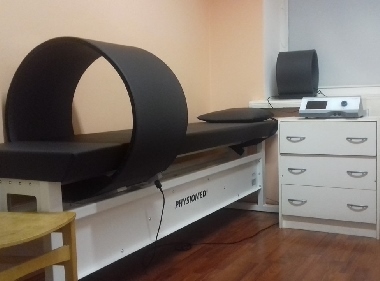 Magneto laser therapy – 2€ To treat diseases of joints, radiculitis. Darsonvalization – 2€ Procedure has effects on skin and the subcutaneous tissue, muscle and indirectly affect the internal organs. Causes skin vasodilatation and speeds up metabolism. Ozone, used in procedure has bacteria killing effect. Paraffin bath for hands – 20 min., 5€ Nourishes and stimulates regeneration of frequent washed drained skin. Moisturize extremely dry skin, reduce the chronic pain of arthritis. Bioptron therapy – 1 min., 0,40€ Light Therapy System „Bioptron“ is a medical light therapy device with a specially constructed optical device that emits light similar to that of the electromagnetic spectrum, which is naturally emitted by the sun, but without the UV rays. „Bioptron“ biostimuliacinis characterized by the emission of light, which improves microcirculation, strengthens the body's immune system, leading to the regeneration of the whole body and the impact of the strengthening process. „Bioptron“ used to treat wounds (wounds after injury, after surgery, pressure ulcers, ulcers in the legs, burns), pain (rheumatic disorders, back, shoulder and neck pain, muscle and joint pain), skin problems (acne, eczema, psoriasis, skin infections S) Treatment of cosmetology. Oxygen therapy – 2€ Recommended working in an active tense mental or physical work, suffering from chronic weakness, drowsiness and stress. Also suffering from headaches and dizziness, memory loss, or shortness of breath associated with contaminated air. Useful for elderly and disabled people living in multi-storey buildings, and rarely leaving the fresh air. Inhalation – 1,20€ Inhibition of inflammatory and allergic tissue reactions, improves bronchial smooth muscle tone and strengthens the external breathing. Also, there has been cardio – vascular system performance improvement. Inhalation with apromel – 1,50€ Inhalations is for patients with respiratory ailments prophylaxis, pharyngitis, laryngitis, mouth and other nasopharyngeal infections, ulcers. Mouth hydromassage – 10min., 2€ Mineral water carried gums massage. It reduces inflammation, bleeding, improves trophic tissues. It is recommended for periodontitis, cervical hyperesthesia tooth, bad breath, gingivitis, mouth pressure sore ulcers. Eye area vibrotherapeutics – 5 min – 2€, 10 min – 3€ Procedure relaxes muscles, remove eye fatigue, pain, dryness and improve vision, eliminates headaches, improves sleep, skin elasticity and smoothes wrinkles, eye tissue metabolism, blood circulation, provide oxygen improves. Sapropel mud procedure, full body wrap – 20 min., 12€ Sapropel – it's jelly-like substance that formed over several thousand years when there was no technogenic pollution in lakes bottom form plants and animals. It is rich in B vitamins, micro and macro elements, amino acids and biostimulants, sapropel mud is not only clean, but also a valuable for therapeutic procedures. Sapropel wrap is performed on a heated lounger, the patient's body is covered with sapropel mud and wrapped in a special heat trapping blanket. Sapropel procedure improves blood circulation in the tissues and organs, metabolism, absorption of oxygen results in more active endocrine glands stimulates immunity, decreases blood clotting, swelling and other symptoms of inflammation. Applications relieves joints, spine pain. Physical therapy – 30 min., from 3 people group – 3€, individual – 10€ Physical therapy helps to improve and maintain musculoskeletal, cardiovascular and other systems, improve the function of damaged organs. The exercise activates almost all the body's physiological systems functions. 5 Tibetan exercises training – 30 min., from 3 people group – 3€, individual – 10€ Reduce the stress, improve breathing, digestion, heart and vascular system, strengthen the spinal muscles, improve joint flexibility. 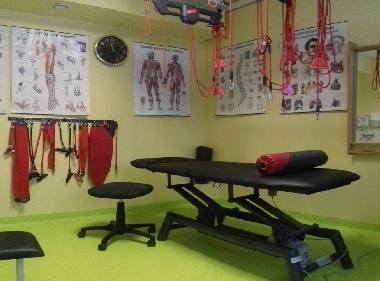 The "Healthy spine" – 30 min., from 3 people group – 3€, individual – 10€ The program consists of: a doctor's consultation, physical therapist counseling, physical therapy.